The devs have said recently that they intend to put out regular smaller updates to fix important bugs etc. As for will we have to start new games with each of these little bugs, well there's one way of finding out and that's playing the game; you'll soon find out whether you need to start a new one or not. From my experience with these smaller updates is that sometimes you do, sometimes you don't. I think it really depends on what the update entails, but, as I said, just flash SN up and try to load a saved game in. You'll get the answer then. Edit: The 'no drowning' bug has been fixed. PLEASE ADD THESE, THAT'LL BE F#CKIN' AWESOME!!!!!!!!! I want these sort of sponges, but that constantly "smoke" out a liquid substance that lights up at night. When the Arctic biome finally releases, I want places in that biome where the player can dive under a sheet of ice with thousands of invertebrates on the sea floor. I also want places where gigantic icebergs riddles with ice caves can be found. What do you think? What else do you want? Please let me know. First time as i played after the H2.0 update i just wanted to stand there and watch the night go over its so beautiful. When watching the night and the eclipse i came to think wouldn't it be cool if there could be meteors crushing down into the water from time to time? Where they are rising the water temperature which is already built into the game. Or Weather changes that affect the water surface as it is currently always calm. As well i would like to see some changes regarding for example the 2 locker types small and big. I never had the need to build a small one as the big needs nearly the same materials so would be cool to see a change there. Please can anyone confirm this if it is true? 'Cause I've been meaning to play Subnautica for a long time, but my PC isn't good enough. If the game releases on XBOX ONE, I'll be over the world. By now, all Subnautica players are well aware of the wrecks found throughout the map that originated from the Aurora. I absolutely love those explorable wrecks, but I'm actually really pissed off that you can't see the wrecks "fly" off the Aurora as it explodes. It makes absolutely no sense that they sort of "warp" instead of crash in position. I therefore would like the devs to review the animation for the explosion so that the players can actually see the pieces fly off the ship. It'll also help the player to find them although there are quite a lot, but the one in the safe shallows biome will be particularly awesome as it will crash right next to the player in the start of the game. Are you(the developers) implicating a docking option for the Cyclops? I know it's likely a silly question but I have to ask. It's been a small pet peeve of mine having to exit via either submersible or just simply swim out the bottom. As a personal hope I'm looking forward to seeing more to the story, such as the underwater base that the journals from the island base indicates...whether it has already been built or is being built? No idea. Keep up the great work! Sad to see no updates to the checkins page. Hi, Devs! (If you see it) I have a question for you. When SOMEONE will be able to do damage to cyclops? Have this Game Controller support for Xbox 360/One Controllers ? So I did not want to start a new topic over this, but we got quite a big update on experimental today. I do suspect it is the ribs in the lost river, but I am at work and can not confirm. Has someone been playing already and discovered something new? Also is there a changelog somewhere with all the small changes experimental gets? I can now without a doubt confirm this. @njohnson1448 I know. Bought it on Xbox weeks ago, and I love it! anyone else see the messages in-game that said about experiments and 1 got away and the space ship coming to save your booty? @Obraxis I have a question: when will SOMEONE be able to deal damage to the cyclops? Yea. Even the sea dragon can only slightly bash it around. Ok here's an idea: how about re-introducing the terraformer in creative? I get that it was removed from the game because you could basically muck up the beautiful world, which goes against the whole "co-exist" vibe that this game has. But what if it was added back to creative? I mean, creative is a gamemode where the symbiosis of player and environment is a little less important, and the player is given more power. What if we got the terraformer back in creative? It would allow those of us who want to really customize our gameplay (make a gigantic seabase somewhere not possible in the base world, or create a scale-model of the marianas trench in the inactive lava zone) to do so much more with the game. What do you all think? I've gotta be the biggest dope on this forum! The terraformer IS still in creative... My apologies to, well, everybody. 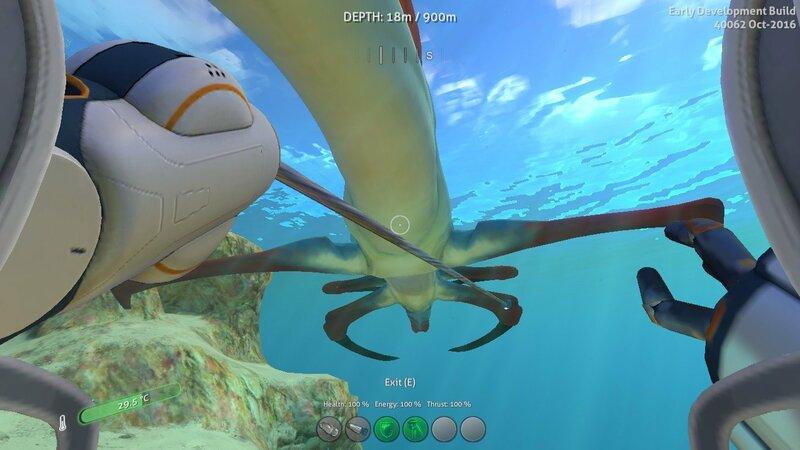 The cyclops is sort of a sitting duck submarine. You can't escape anything with the cyclops. And you can't attack anything with the cyclops either. So the cyclops must be immune unless someone invents a defense system for the cyclops. There is a plan about the cyclops using silent running, which implies making it vulnerable to at least one creature. But I can't imagine how the cyclops could escape from a creature like the sea dragon. The cyclops isn't capable of such advanced moving maneuvers. It'd be more like a turtle trying to outrun a fast mighty lizard and not simply hiding in its shell. So what would be needed? I think the cyclops would need a defense, engine boosters or some decoy mechanisms to escape from leviathans if they could hurt the cyclops. I suspect static traps or collision damage would be a better way to add drama. Things which would force you to exist the submarine in a hostile environment in order to do repairs (kindof like the lava larvae). You can most definitely use the cyclops to do damage. Get over a sandshark, crabsquid, or whatever, and descend. You don't even have to hit bottom. Fire the Grappling Hook on the PRAWN (after you get the blueprints and build one) at a large creature and hang on. Please make a balance update concerning to resources / raw materials for crafting. A source for titanium should only be the vestige / wracks of the aurora including the deconstruction of boxes, wracks, life pods, abandoned seabases etc. The planet should give you any titanium. So the game would force you a resource-saving handling. Give us more robust blueprints that require larger amounts of gold and the other plentiful resources. I've actually found while playing the game (since the Dec. 2016 update) that the Silver balance is not that bad. Personally, I don't want it too easy to find the resources for the more complicated/elaborate items, as the main premise of the game is Survival and one shouldn't really be able to create a computer chip or wiring kit at the drop of a hat.